Read here about the BARBEDIENNE FOUNDRY. 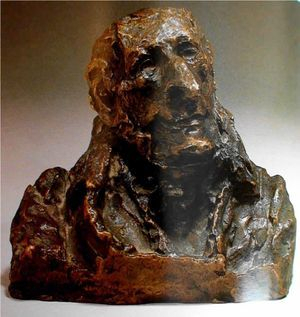 Below are listed all sculptures by Honoré Daumier produced in the BARBEDIENNE FOUNDRY. D'ARGOUT, Antoine-Maurice-Apollinaire, Comte (1782-1858). His oversized nose made him a favourite subject of caricature. He was responsible for the bloody suppression of the silk weavers revolt in Lyons. Because of his tendency of verbal blunders, Daumier showed in his coat of arms a donkey's hat as synonym for his limited intelligence. The scissors represent his work as a theatre censor. D’Argout was a supporter of Louis XVIII in 1814 and became State Counsellor in 1819. He then supported Charles X and consequently Louis-Philippe who appointed him Minister of the Navy in 1830. He was later nominated Minister of Commerce and held the positions of Minister of Public Works and Culture in 1831. After a short period of 2 years as Secretary of the Interior (1834) and Governor of the French National Bank, he was appointed Minister of Finance in 1836. He managed to survive political changes and supported the new Empire under Napoleon III, followed by his nomination as Senator for life and Governor of the French National Bank. Read here ABOUT THE BUSTS: TECHNIQUES, MATERIALS AND OTHER ASPECTS. Find out about the HISTORY OF OWNERSHIP.